Seating area viewed from Filopappou Hill, Athens. Image courtesy of Eleanor Wright. 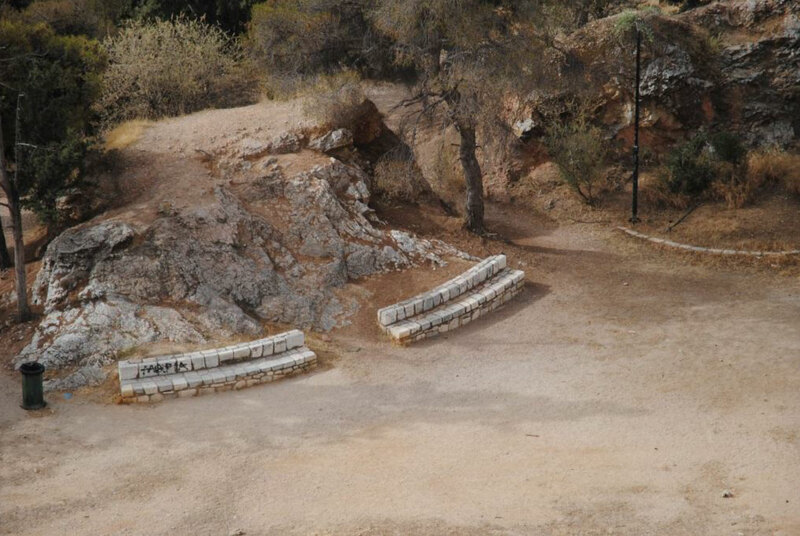 “Arena” is the title of the presentation to be given by Eleanor Wright (Arts Bursary Holder at the British School at Athens). Eleanor Wright’s practice makes visible the patterns and relationships between people, design, materials, objects and architecture – addressing existing perceptions and hierarchies that exist within the contexts of artworks and the exhibition format. Through both handmade and industrial processes Wright remodels objects and environments into forms and symbols using various materials that are lifted from both design and architecture – generating a sculptural language that reflects a holistic attitude towards art and wider culture. During her time in Athens, Wright has been researching the city’s architecture and layout of public space. Her starting point has been the ancient theatres of Greece and their role in the formation of public thinking and democracy. Widely considered to be the first built structures for assembly, theatre was synonymous with politics and served as a thinking device for voting people. Leading on from this context of gathering, Wright has been documenting Athens’s generous provision of public seating areas, which are dotted all over the city. Incorporated into the fabric of the city with no apparent hint of commercial interest or intent, Athens seemingly represents an older (more healthier) view of what public space means to a city and its people – as communal sites for gathering, observing and conversing. Wright utilises these types of spaces as tools to consider wider issues around the body in relation to the built environment and the politics of space. * Please note that the entrance will be open until 7.15 p.m.